I know the dark well; it's the light that scares me. Content: The dialectic is a method of understanding reality by analyzing an idea (thesis) and its opposite (antithesis) to arrive at a solution (synthesis). It attempted to solve the great problems of society, to understand human identity and experience, and to define spirituality, meaning and truth. This body of work records my dialectic process. It required the creation of a visual plane to explore the relationship of dualistic forces. I explored the space between dualities. My work is an integration and reveals my development as a woman artist. Structure: Weave structure is an apt metaphor for the dialectic. The grid emerges from the confrontation of two opposing forces, two sets of yarns intersecting at right angles. Color and texture: Color combinations exhibit notorious subjectivity. Each shot of yarn across the web represents a moment in time. The next shot, the next moment, changes the aspect by its presence. Texture is a strong feature of fiber arts. I use it sparingly in Resolution, to deepen or mask color transitions. Proportion: Fibonacci proportions, derived from growth in nature, reinforce a sense of order. Line, shape and proportion decisions in this work were guided using this system. Shape/Line: It's all done with mirrors. The shapes in Resolution were developed from the integration of two weaving structures, Krokbragd and tapestry. Lines create shapes which shift subjectively within the atmosphere. Design: The boxes in Resolution reflect both thesis and antithesis. They are the same element from different perspectives. Their movement is through the plane, from one reality to the Other, an infinite cycle of resolution and transformation. 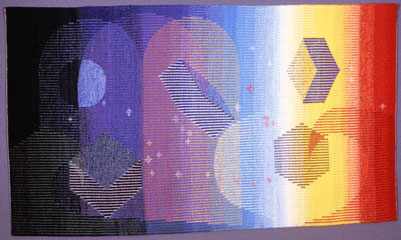 Judy Ness, Fiber Arts, May, 1999-2014.